Early May was warm and dry in Greater Moncton which was a continuation from April and led to an increased number of forest fires throughout New Brunswick. Mid-May was much cooler and wetter which was good news for firefighters. Late May continued to be cool and wet except for the last three days which proved to be warm and humid. New Brunswick is experiencing its warmest day so far this year and at least eight record highs have been broken. Environment Canada says the Greater Moncton International Airport broke a record today at 30.8°C beating the old high of 29.3°C from 1999. Kouchibouguac, Alma, Saint John and Caraquet were among the places with new record highs today. The hotspot in the province was Fredericton at 32.7°C. The excessive warmth is due to a dome of high pressure working its way to the Maritimes from down in the Gulf of Mexico. I always love this time of year – it’s lilac season! 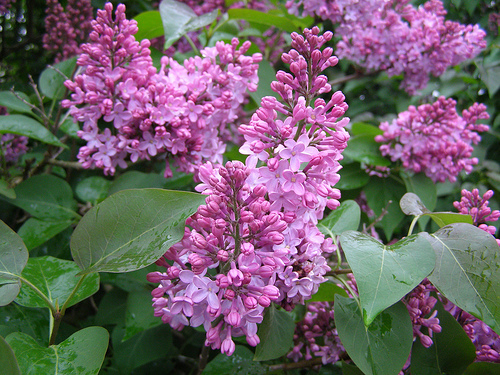 Despite all of the rain we’ve had in Southeast New Brunswick lately, the lilacs are now in full bloom across the region. Their sweet fragrance is amazing and one of the best highlights of spring. 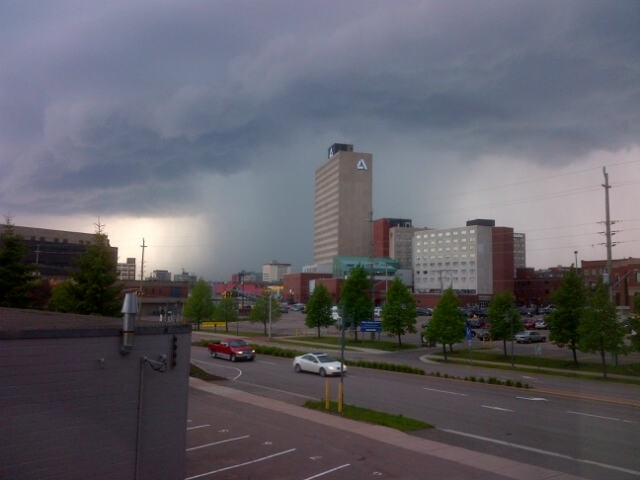 It was a very wet weekend across most of New Brunswick. A slow moving low pressure system brought copious amounts of rain with the southwestern part of the province getting a downright deluge! Forecasters at the Canadian Hurricane Centre say an active hurricane season is expected this year with an above-average number of storms. One or two storms typically make landfall in Eastern Canada every year with another two or three entering offshore waters. Although the season officially begins in June, hurricane activity mainly occurs between mid-August and mid-October. The U.S. National Oceanic and Atmospheric Administration (NOAA) is predicting a 70 percent likelihood of 13 to 20 named storms, of which 7 to 11 could become hurricanes, including 3 to 6 major hurricanes. In 2012, the Canadian Hurricane Centre monitored five tropical cyclones and issued bulletins on four storms – two which made landfall and two which stayed offshore. 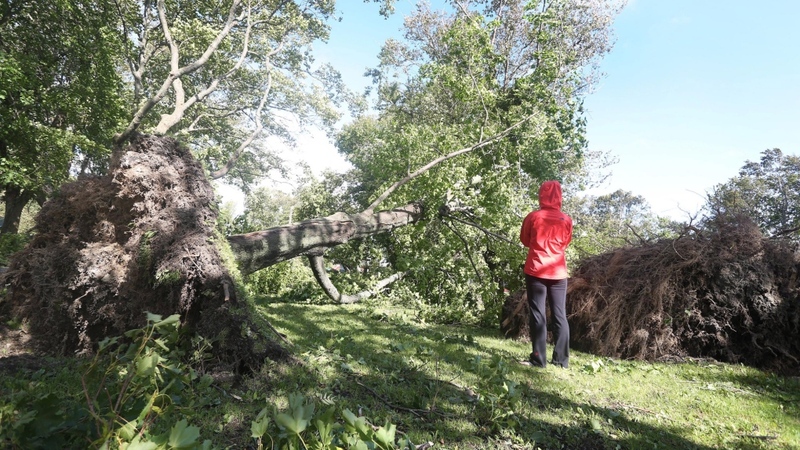 On 11 September, former Hurricane Leslie struck Eastern Newfoundland causing minor damage and on 29-30 October, the far-reaching influence of Post-Tropical Storm Sandy was felt from Ontario to Atlantic Canada. In the United States, Hurricane Isaac was the only storm to reach landfall as a hurricane in Louisiana and while Hurricane Sandy caused considerable damage in New Jersey and took 147 lives, it lost its status before striking land. The American heartland state of Oklahoma is used to tornadoes but not one quite like this. 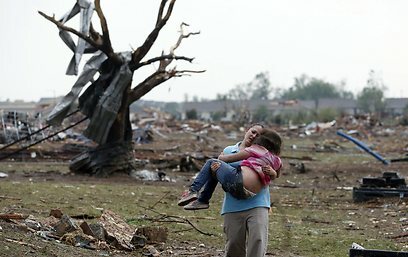 The U.S. National Weather Service says the tornado that hit the Oklahoma City suburb of Moore was a top-of-the-scale EF-5 twister with winds of at least 322 kilometres per hour. Authorities say 24 people, including nine children, were killed when the tornado flattened homes and demolished an elementary school yesterday. The tornado’s path was 27 kilometres long and two kilometres wide. The twister is the first EF-5 tornado of 2013 to hit the United States. Accuweather has unveiled its summer outlook for Canada and it looks decent for New Brunswick. Above normal temperatures and near normal precipitation are in store for the province with below normal precipitation in Northern New Brunswick. The big concern in late summer is hurricanes and tropical storms and Accuweather projects a higher than normal number of storms for the Atlantic Basin. Since 2000, there has been an average of one land-falling hurricane on Canadian soil every other year and before that the rate of landfall was closer to one every three years. 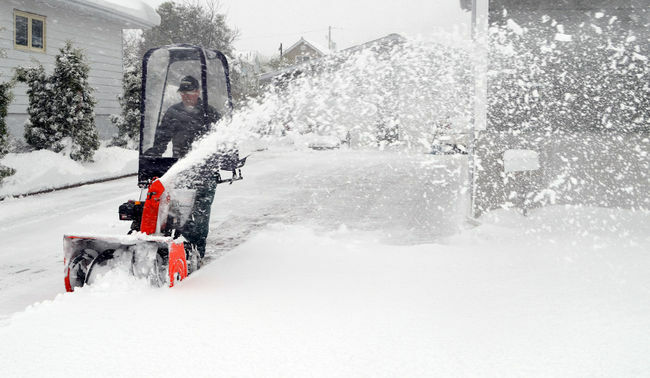 Central Newfoundland got hit with a freak snowstorm that almost no one was expecting especially during a long weekend that typically marks the beginning of summer. 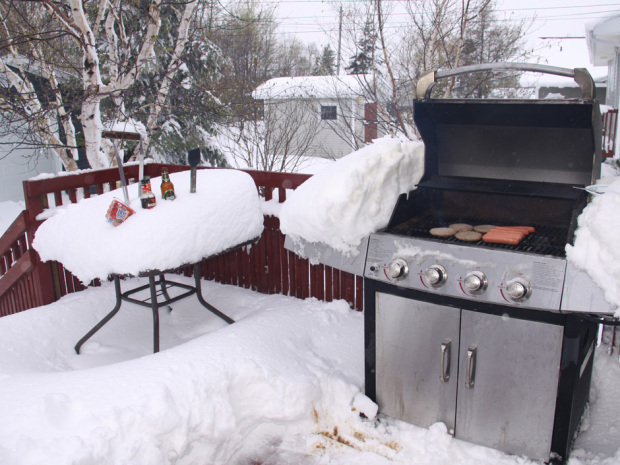 Gander was the hardest hit with 58 cm of snow – the highest total amount to ever fall in May. 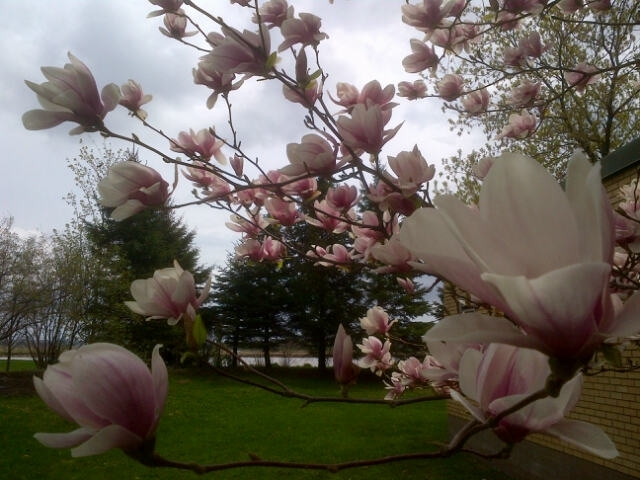 The heavy, wet snow covered green lawns, flowers and trees that had already sprouted leaves. Campers were forced to cancel their weekend plans although some in RV’s toughed it out. Locals say it’s a snowfall to remember. It’s hard to believe that we’re talking about snow in mid-May but many areas of New Brunswick saw snow flurries today and rain mixed with snow on Prince Edward Island and northern Nova Scotia. In Greater Moncton we didn’t see any snow today but temperatures have been cold with a daytime high of only 7°C. Keep in mind the normal high for mid-May is 18°C. Environment Canada has issued a frost warning for much of the Maritimes tonight as temperatures drop to zero or even lower. An unseasonably late winter storm dumped heavy snow over Northeastern Ontario on Sunday. This storm resulted in quite the white Mother’s Day with conditions more typical of winter rather than mid-May. Snowfall warnings have since ended as the heavy snow has moved away into Western Quebec. Timmins received 26 cm, Chapleau had 32 cm, Kapuskasing had 8 cm and even somewhat southerly Sault Ste. Marie picked up 7 cm of snow.